Millions of people worldwide have discovered the value of Instant Immersion™, the most effective program available for learning to speak a foreign language quickly. Based on the highly effective Euro Method™ (an intuitive approach that surrounds you with native speakers and a new culture), Instant Immersion™ Hawaiian provides authentic dialogue and traditional settings that immerse you in the Hawaiian language and lifestyle. Written and developed by university professors and linguists, each lesson in this 8-CD suite utilizes the same learning methods and retention techniques used in university-level programs. The lesson plan is designed to build a solid foundation of vocabulary terms and fundamentals, all of which are reinforced throughout subsequent lessons. You ll move quickly from basic to intermediate speaking level with easy-to-follow activities highlighting pronunciation, vocabulary, grammar, sentence formation, and listening. Additionally, the cultural notes provide an inside glimpse of Hawaiian customs island by island, and introduce appropriate etiquette for various situations. For business or pleasure, you ll quickly learn to confidently speak Hawaiian with Instant Immersion™. 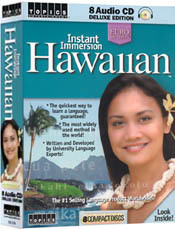 Why isn t there a companion book?We at TOPICS Entertainment are confident that these Instant Immersion™ audio recordings provide the fastest, easiest way to conversational Hawaiian fluency. With its focus on spoken language instruction, the listen to learn approach of Instant Immersion™ Hawaiian yields results fast!